The warm welcome received in Hong Kong by the Chinese mainland Olympic delegation can help mend Chinese mainland-Hong Kong ties in the wake of pro-independence protests and help strengthen Hong Kong residents' national identity, analysts said. The 64-strong delegation saw 42 gold medalists and five coaches, including ping-pong player Zhang Jike, swimmer Sun Yang, the Chinese women's volleyball team and coach Lang Ping, visit the region, the Xinhua News Agency reported. Hong Kong also invited athletes who did not win gold at the Rio Games, such as bronze medal-winning swimmer Fu Yuanhui and badminton superstar Lin Dan, according to Xinhua. Fu became an Internet sensation in China after her captivating post-match interviews. 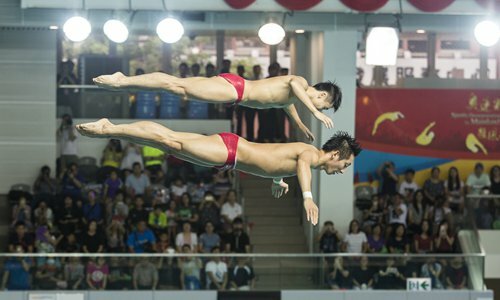 Xinhua reported that the delegation will have three showcases during the trip, including ping-pong and diving exhibitions with children. Some 6,000 tickets were sold in three hours last week, and tickets which had only a face value of HK$20 ($2.5) were apparently being sold by scalpers for as much as HK$1,000. According to Hong Kong-based newspaper Ming Pao, Fu said during the press conference in Hong Kong on Saturday that she loves Hong Kong and she had never dreamed of being so popular. She stressed that "We [the mainland and Hong Kong] are family, like brothers and sisters." The delegation also faced some difficult questions as a reporter from Hong Kong's Apple Daily asked the athletes how they would respond if they encountered protests during their visit as tensions between the mainland and Hong Kong were on the rise. Wen Wen, a mainland official who hosted the press conference, said the question was irrelevant to the purpose of their visit. He said sports are not related to politics and that they need to let go of politics, Ming Pao reported. It has been a tradition for mainland medalists to visit Hong Kong after the Olympics since the Sydney Games in 2000. This event can always boost national pride and enhance the ties between the mainland and Hong Kong. Zhang Dinghuai, deputy director of the Center for Basic Law of Hong Kong and Macao at Shenzhen University, told the Global Times the trip can boost patriotic feelings and raise a sense of national pride among Hong Kong people. Tian Feilong, an assistant professor at Beijing-based Beihang University, told the Global Times that the timing is interesting, as Legislative Council elections will start very soon on September 4, so this trip could enhance the national pride of Hong Kongers and affect the election to some extent. Compared to exchanges between scholars, business elites and politicians, regular Hong Kong residents will be more attracted by visiting sports stars, appealing to young and old alike, Tian said. According to a previous Reu-ters report, Hong Kong-independence activists protested at a screening of an Olympics badminton match between Hong Kong and the mainland, the first time anti-mainland sentiment in Hong Kong had spilled so explicitly onto the Olympic stage. "Pro-independence activists caused some trouble, but when the women's volleyball team beat many strong teams and finally won the gold, the activists had no chance to spread any negativity," Tian said. Chinese women's volleyball is very popular in Hong Kong. Hong Kong-based Phoenix TV reported that on the day of the final, many Hong Kongers watched the game as they had morning tea and dim-sum, and all the customers cheered after China eventually triumphed. At a shopping mall, many people were standing in front of big screens during and after the game, and one young man could not hold back tears as he told a Phoenix TV reporter, "This is a team sport which needs unity to win, and our Chinese with black hair and yellow skin also need unity." "In the 1980s, during the era of China-UK negotiations over Hong Kong, the team was a legend which brought a lot of victories and boosted Hong Kongers' Chinese identity," Tian said. "Aside from these memories, the current team's excellent performance in Rio can also inspire the youth of Hong Kong," he noted.